In a world where most properties are fitted with UPVC windows and doors, many people are often under the impression that UPVC is the most advantageous material to use when it comes to choosing the materials for your homeâ€™s windows. After all, UPVC is often available at a budget price, is secure to protect against trespassers and is generally guaranteed for between 10 and 30 years. 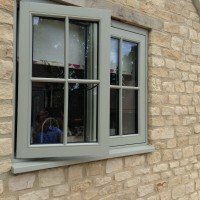 Here at the Windows and Doors joinery though, we are advocates of ready-made wooden windows and thatâ€™s why we choose to manufacture, supply and install high-quality wooden windows in homes based in Buckinghamshire and the surrounding areas? Ready made wooden windows are definitely more sophisticated than ready-made UPVC windows. Available in a variety of hardwoods, wooden windows can be chosen to suit the overall style of your home and give a property an elegant aesthetic. 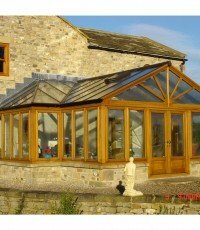 Many people opt for oak wood to ensure their property looks as prestigious as it can be. After all, Oak is a popular British wood that oozes luxury appeal. Wooden windows offer equally successful security in comparison to UPVC. A well-made, high-quality locking system will ensure your windows protect your property against theft. It is important, however, no matter what material windows you own, to ensure that you close and lock your windows when leaving a property empty! The great thing about ready made wooden windows is that wood offers a style that has lasted and will last centuries, while UPVC may go out of fashion, it is far less likely (as wood has been around so much longer that wood windows will go out of style completely. As a result, perhaps good-quality, durable wooden windows could increase the value of a property. Why ready-made we hear you ask!? For some people the idea of ready-made wooden windows combines polar opposites, after all, shouldnâ€™t wooden windows be bespoke in order to have the desired effect? In our opinion, absolutely not! Whether you believe it or not, wooden windows still hold sophistication when theyâ€™re ready-made. Here at Windows and Doors UK, we manufacture our hardwood windows and doors using skilled techniques, created only by expert craftsmen who know exactly how to produce the highest-quality ready-made wooden windows possible. In fact, weâ€™re so confident that our wooden windows donâ€™t need to be bespoke, weâ€™re sure you wouldnâ€™t be able to tell the difference between our bespoke wood windows and ready-made wooden windows. Essentially, ordering our ready-made wooden windows can help you save money, without losing any sophistication or luxurious appeal. If you would like to find out more about our ready made wooden windows from Windows and Doors UK, then please do not hesitate to contact us.